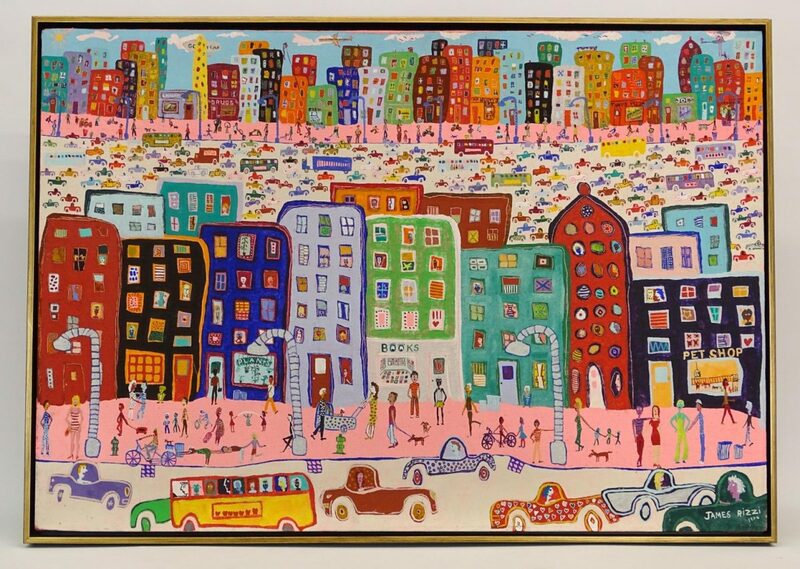 Copake Auction brings highest auction price on record for James Rizzi – COPAKE AUCTION INC.
On July 28, 2018 Copake Auction offered lot 576 a street scene, oil on canvas by James Rizzi (1950-2011). Signed and dated 1975 with original paper card included. 26 1/2″ x 38 1/2″. 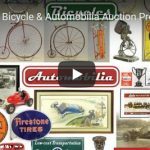 It was conservatively estimated at $2,000-3,000 based on auction records for similar works but as absentee bids started coming in before the sale it seemed there was something special attracting interest in this piece. With an auction record high of $21,360 in 2017, up from around $6,000 in 2014 for similar sized pieces it seems Rizzi’s works are becoming in high demand. Copake tripled other top results bringing $61,360 to a buyer in Germany. Rizzi’s contributions to charities throughout his life resulted in a Public School in his name in Duisburg, Germany. 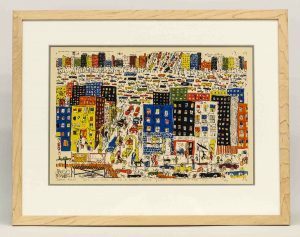 James Rizzi (New York 1950-2011), “It’s So Hard To Be A Saint When You’re Living In The City”. A smaller Rizzi work was also offered in the July sale, “It’s So Hard To Be A Saint When You’re Living In The City”. Signed, numbered and dated (50/75, 1976). Sight 14″ x 21″. Estimated at $200-300 this piece brought $1,416. At first glance, James Rizzi’s art may easily be mistaken for the early artistic efforts of a young child. This is not an entirely erroneous judgment, for it is certain that Rizzi wants to incorporate the freshness and vitality of children’s art in his work. In this regard he is not alone. Some of the great artists of the twentieth century, including Klee, Dubuffet and Miro, deliberately used a primitive, childlike style in their mature work. 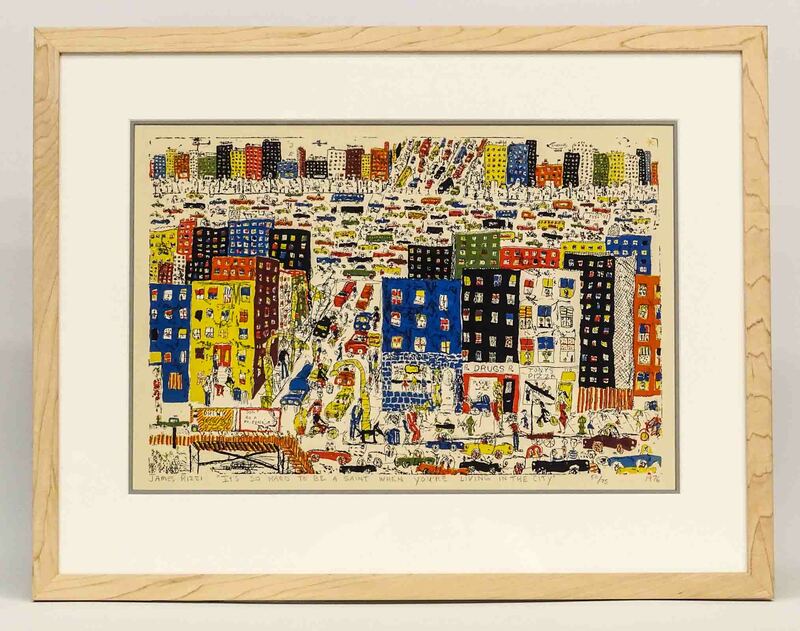 Rizzi, born and raised in New York, has turned his childlike imagination into artistic powers to transforming the city itself into something wonderfully original. His large panorama of urban life are teeming with energy and life, reflecting all the diversity and human variety that is at the core on New York. These are not “mean” streets but uproariously happy ones, where children jump rope, shoot baskets, and walk their dogs. If the sidewalks belong to the young people, grown ups, especially men, are imprisoned inside an army of automobiles. The vehicles are as diverse as and crazily idiosyncratic as the people who drive them.